The life of Faith Erin Hicks’s comic book superheroine Superhero Girl is marked by identity crises, many of which are inspired by a figure who has become her arch nemesis… and the arch nemesis of many women in fan communities, the man who thinks of women in fandoms as “fake geek girls”. The term ”fake geek girl” is one used by conservative males in the genre fan community to try to alienate women from fandoms. These are the same type of males who will approach women at cons and quiz them about their knowledge of fandoms in an attempt to “prove” they don’t belong there. It is another element of con sexism and “geek gatekeeping”. Superhero Girl encounters geek gatekeeping when searching for an arch nemesis. She is approached by a man who quizzes her about various aspects of the superhero genre that he believes are canonical: asking if she can fly, asking for her origin story, telling her that she needs to have a tragic catalyst for her desire to become a superhero. When he discovers that “all” she can do is leap over tall buildings, lift heavy objects, and shoot rays from her eyes, he tells her “then you’re not a real superhero”. He tells her the rules she should be using to live her life like “Rule one: You gotta have a tragedy in your past that made you want to become a superhero. Two: you need a uniform complete with logo, although spandex is optional. And finally, of course, a villainous archnemesis.” He concludes by telling her “If you don’t follow the rules, you’re just some nobody in a mask.” Her arch nemesis excludes her from the very job that she is doing on a regular basis, superheroing, even though he, himself is not a superhero. She is subjected to geek gatekeeping from her own profession. Faith Erin Hicks is able to illustrate the pervasiveness of geek gatekeeping by abstracting it onto a superhero who similarly faces the existential crisis that many female fans have when subjected to alienating techniques by male fans who want to cast women as an inescapable Other. With its blend of wit and play with the genre, Faith Erin Hicks’ The Adventures of Superhero Girl is a definite classic. Superhero Girl is a hero who can be just as empowered giving a homeless person spare change as from fighting a giant space monster… and just as disempowered by forgetting to put on her mask, leaving her cape at home, and having to deal with her arrogant corporate superhero brother Kevin as she is by supervillains who manage to put the whammy on her. Plus, she has to deal with those awkward moments of running into ninjas at the grocery store or when she is applying for jobs. But, her superheroic activities are so practiced and proficient that she has most criminals trained so that all she needs to do is tell them to “put it back” when they rob banks to defeat them. Hicks’ Superhero Girl is not powerful because of her superpowers (of which she has many), but rather in her ability to be fundamentally human and to play with the superhero genre overall. You can discover more about Superhero Girl at http://www.adventuresofsuperherogirl.com/ . Displacement is a factor that is prevalent in the lives of many people who have had to leave home for whatever reason. The finding of “home” is a nebulous, complex, and constantly changeable phenomena. Julie Czerneda explores the search for home in a foreign and confusing space in Riders of the Storm. On a planet with three self-aware and hugely biologically different species (the Om’ray, Oud, and Tikitik), agreements exist to keep the balance between these three peoples from shifting. Czerneda focusses on one group, a small band of travellers from the Om’ray who defy social customs by their biological differences. They threaten the balance that the Om’ray seek to maintain by the fact that they are different, that they represent change in a society that resists change and prefers to conceive of existance only in the form of living people (ignoring notions of the past). This small group of travellers are manifesting new abilities beyond the natural abilities of the Om’ray, which include telepathy, healing, collective dreaming. The telepathy of the Om’ray has created a notion of fundamental racism. Since they are only able to telepathically sense each other, they cast all other non-Om’ray groups as “not real”. They see themselves as the centre of the world and believe that the world only exists where they are. They have created an isolated society both from other races, but also from other periods of time. They see their society as always having been the same, that history does not exist and isn’t worth exploring because it would suggest that things were capable of changing. Aryl Sarc has been forced to become the leader for her small band of Om’ray, leading them on a journey that they believe to be impossible because it represents the possibility of change, something her society resists, and the necessity of shifting the status quo. Aryl doesn’t seek leadership, but she is a figure who represents change by her very body – she has abilities that are far beyond other Om’ray and the uncertainty within her body makes her more willing to accept uncertainties and therefore willing to confront challenges. In a society that focusses on static notions of culture (the idea that things don’t change) and has an interest in keeping secrets, Aryl tries to make everything open to her people. She is interested in opening questions in a society that largely accepts things unquestioningly. She and her group of exiles finds an abandoned Om’ray village, one that presents the inevitability that things do, in fact, change. It represents a place for a new start and one that embodies history, opened secrets, and the challenge and potentialities of a new future that is different from the now. The uncertainty of this village, Sona, makes it an ideal place for a changeable people. The group of exiles have to create a new sense of home in a place that is embodied by history, a history that speaks to them (literally through dreams about the past and figuratively through their need to interpret objects that have remained). Those who have been exiled out of a fear of change, now have to live with change and the flexibility, fluidity, and the general flux that is represented by an uncertain future. They seek to create an idea of belonging in a place that is different, that has history, and that keeps reminding them that things can and do change. They are haunted by the reminder that the land they are on predates them. Aryl becomes more comfortable with ideas of change and with notions that would have been considered threats to her society. She is able to help her society to accept and be comfortable with ideas of chance. Aryl’s comfort with change makes her an ideal person to speak to people of other races – she is willing to speak to the Oud, the Tikitik, and even a human visitor to her planet. She is not restrained to notions of the Om’ray’s singularity and superior significance. She learns to be willing to accept that those who are “not real”, may in fact just be different and that intercultural communication, although uncertain and potentially confusing, is worth approaching. When trying to approach the Oud and Tikitik, she learns from the human visitor to her world, Marcus, that she will need to take into account both cultural differences and also biological differences since what is biologically normal for the Oud would be threatening for the more vulnerable Om’ray. As outsiders wherever they end up going, Aryl’s group of exiles create community through their willingness to accept change, to create community through difference and to cooperate with others who their society traditionally resists or views as insignificant. 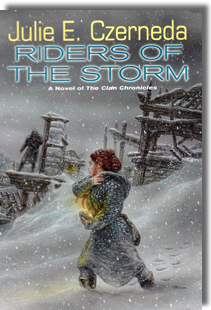 You can explore Riders of the Storm and other books of the Clan Chronicles series through Julie Czerneda’s website at http://www.czerneda.com/sf/clan.html . Throughout the month of April, Speculating Canada will be bringing you discussions of aliens every Wednesday. 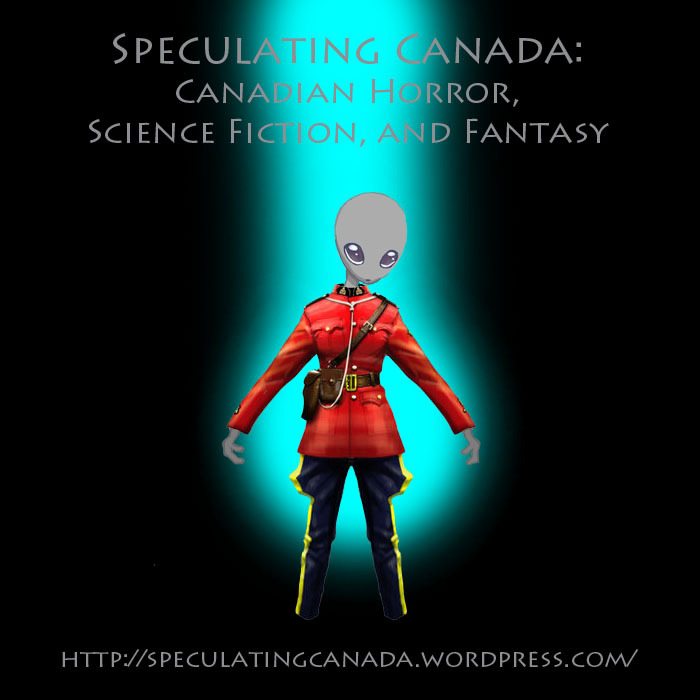 Aliens in Canadian SF can be used to explore Canadian multiculturalism, the feeling of alienation, diaspora (being without a home), ethnicity, the clash of cultures, and the extents and limits of the human. Aliens are often created as a foil, an opposite, an other to humanity, but many Canadian SF authors (such as Julie Czerneda, and Douglas Smith) complicate this ideology and put the reader in the perspective of the alien, occasionally even alienating the reader from the experience of the ‘human’ by presenting human beings as alien in behaviour as the figure from a different planet. Aliens call on us to question ourselves, to see ourselves from a new perspective and examine what it means to be human. They challenge us to look at ourselves in a distorted mirror. In the words of Canadian author Judith Merrill “We have met the Alien and it is us” (Afterward, Tesseracts). Silvia Moreno-Garcia is a Mexican-Canadian author and editor and the owner of Innsmouth Free Press. I particularly enjoy her work because it often gives voice to those who are othered in society and I was really happy that she agreed to do an interview with me here on Speculating Canada. In the upcoming interview, Silvia tells us about how stories influenced her life from an early age and prepared her to be a writer, about the different take that she has on the figure of the monster, the role of social oppression in SF, the power of transgressive writing, and ideas of home. Join us this Wednesday January 16th to hear about minivan monsters, Ms. Moreno-Garcia’s ability to ask tough SF questions about the people who are under-represented, and hear about some methods of helping SF to be more inclusive of the diversity of people. If you haven’t already seen it, you can check out my review of Silvia Moreno-Garcia’s “A Handful of Earth” at https://speculatingcanada.wordpress.com/2013/01/07/abandoned/ .